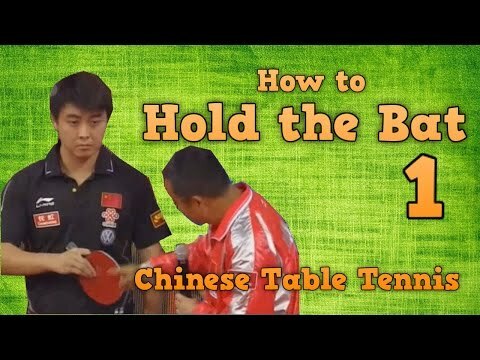 how to hold the table tennis correctly! and how to choose the right handle for your racket. Chinese coach focuses a lot on table tennis grip. Read the best tips from Chinese coach for the grip here. Should I use a table tennis tape? Which are the best table tennis tape? In general, there are 3 main grips in table tennis: shakehand grip (or European grip), penhold grip (Chinese grip), and Japanese/Korean Penhold grip (variation of penhold style). There is also a small variation like V-grip (American style), pistol grip (unorthodox style). However, in the modern table tennis games, the main grip style is: Shakehand (95%), and only 5% of players use the Penhold style. Each type of grips has some pros and cons. Timo Boll‘s grip is very narrow and a clearly Forehand oriented grip. The index is very high and can support your Forehand stroke. Timo Boll’s grip: European style and forehand favorite grip. He does change grip during rallies. Zhang Jike and Ma Long have a different position of thumb and index finger. His grip is very compact. The thumb is a little bit higher which support his backhand. While Ma Long’s grip is forehand/counter loop oriented. Wang Hao always has 2 fingers on the bat at all time, so he can have a very good Reverse Penhold Backhand. These fingers serve as good support for your backhand. The thumb is on the forehand rubber and is not as deep as Ryu Seung Min’s forehand grip. While Ryu Seung Min‘s forehand grip is “deeper” (his thumb is very forward), his traditional backhand grip is different. His fingertips don’t touch the rubber. Ma Lin is somewhat in between. Liu Guoliang says if you want a good backhand like Wang Hao to use Wang Hao’s grip. If you want good forehand use Ryu Seung Min’s grip. If you want a good third ball, serve, and serve return, use Ma lin’s grip. Nowadays, most of the table tennis player will choose to play “shakehand”. It’s considered as the modern table tennis grip. China is the only country that promotes the conventional “penhold style”. It’s important to keep the style of penhold because of its flexibility and variation. It is part of the beauty of table tennis. I think that table tennis coach should help promote penhold to western players. V-grip is an orthodox grip. It’s similar to Danny Seemiller grip. The pistol grip is an orthodox grip, it’s a lite variation of penhold grip. However, it’s more comfortable on the backhand side. Shakehand grips propose many advantages: the balance between forehand and backhand. Power away from the table. No weakness at the two wide sides. Aggressiveness to return the ball (with the backhand flick over the table). Penhold doesn’t have the “elbow weakness” because penhold style covers very well in front of the body. The main weakness of “shakehand grip” is the elbow. You follow, and attack to the elbow! It’s deadly to the shakehand player! I encourage coaches to not just give a shake hand paddle to every kid, but to choose some of the kids that are quick to adapt to try penhold. Xu Xin’s style is so beautiful! Liu Guoliang gives us a good introduction to grip the bat based on your playing style. Holding your racket is the first and the basic technique that you should master! These are the example of good grips that you should learn. The grip of a professional table tennis player is worth studying. You can modify your grip based on your penhold style or shakehand style. Xu Xin’s grip: Effective to play away from the table. But weak at backhand’s attack. I will explain to you how to hold the table tennis bat/racket correctly by using the to Chinese coaching. “Holding a table tennis racket” is the first table tennis lesson. Having a good grip in table tennis is crucial as it allows you to optimize your technique. Without a correct grip, you cannot do the strokes correctly and never improve to a high level of table tennis. What does the correct shakehand grip look like? Here you are! Some coaches didn’t correct the grip or didn’t show their players how to hold the bat correctly at the beginning. That’s the main reason that the players never progress or just improve slowly. The coach just said “Hey, pick up your racket and start training on the table”. It’s not a good way of coaching the beginner player. In China, the coach shows the principles of the grip and lets the young kids play with the ball (without the table) at least one week. The kids must feel his racket and adapt his grip. This first lesson is very important as the grip will stay with you all of your table tennis life. If you have any problem with your blade handle, you should use a table tennis grip tapes. Why? Because if your table tennis handle is too slim, too thin, it will affect your game. A too thin handle is very dangerous because your blade can fly away at any time. Or you need to hold your racket tightly, and you know “Holding too tight your racket will kill your game“! Yes! Using a table tennis grip can enhance your execution of shots and improve your game. The grip tape is normally very light and thin! It only adds about 2g – 3g to your blade. However, it is sticky/ grippy, which can enhance your grip and your feeling. You can buy the tape from Butterfly, Nittaku, Xiom or Paddle Palace. Nittaku grip tape will do the job perfectly! That’s the one that I like the most! Nittaku Table Tennis Bat Wrap Handle Grip is useful! And they last for a long time! At least 3 years if you keep your handle properly. Xiom or Paddle Palace is another cheaper solutions if you don’t buy the Butterfly or Nittaku grip tape. You can also buy some cheap Anti-Slip Sweat Absorbing Soft Grip Tape from China. Order Butterfly table tennis soft grip tape here. Or buy XIOM Table Tennis Racket Grip Tape GT1 Excellent Pingpong Paddle Grip Tape, Made in Korea (2 Grip Tapes in a Package) here. dear coach. I have used the Nitakku grip. Its very good. I recommend it too. I am planning to add grip tape on my bat’s handle . Will it reduce the good feeling/vibration that i have? I am planning to add a grip to my bats handle to make it thicker. will it reduce the good feeling / vibration that i have?